One of them is a child of 7 years. Among the dead there are 4 women. Religious and militant Islamic fundamentalists were inciting the crowd. The fuel is the same as that used in the destruction of Shanti Nagar (1997); Sangla Hill (2005) and Koriyan, a day before. The police accused of negligence. Gojra (AsiaNews) - Pakistani special forces have taken control of the town of Gojra (Punjab) after yesterday’s bloody episode in which at least 8 people - including 4 women and a child of 7 years - were burned alive and 20 others wounded. At least 50 houses of Christians were burned and destroyed and thousands of faithful fled to escape execution. Relatives of the victims refuse to take care of dead bodies and do not want funerals until the culprits are arrested. Some of the killed have been identified: Hamed Masih, 50, Asia Bibi, 20; Asifa Bibi, 19, Imam Bibi, 22; Musa 7; Akhlas Masih, 40, Parveen, 50. 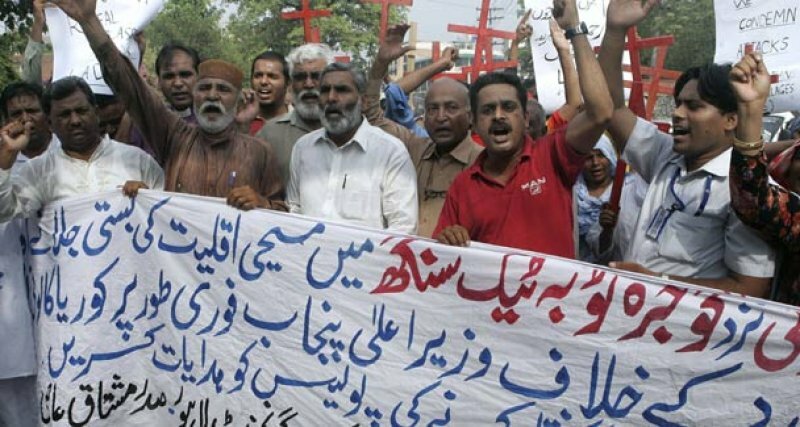 At least 3 thousand Muslims, after they have were incited by local religious authorities, marched to the Christian village Gojra founded 50 years ago. Groups of young Muslims - perhaps from the Sunni group Sipah-e-Sahabaha - with their faces covered started to shoot wildly. The villagers fled, but some were trapped and were killed by the uncontrollable fire unleashed by the mob. To burn the houses, the militants used a particular fuel, that is difficult to extinguish. According to witnesses, the same fuel was used in the village of Shanti Nagar, burned in February 1997, in the destruction of the village of Sangla Hill (2005); in the burning of the 50 houses of Christians and the two churches on the evening of July 30 in Koriyan near Gojra. It all started weeks ago with charges of blasphemy against Talib Masih, who is accused of having burned pages of the Koran during a wedding ceremony on July 29 at Koriyan. On July 30 hundreds of Islamic militants attacked and set on fire the houses of Christians in Koriyan and two Protestant churches, the Church of Pakistan and the New Apostolic Church. According to police, some Christians fired shots against the militants, further fuelling their violent response. The minister for minorities, Beat Shahbaz, a Catholic, has accused the police of negligence. The local Christians say they have been requesting the protection of law enforcement officers for days because the situation was tense, but have been ignored. Some Christians argue that although the police were present during the attack at Gojra, the thugs were not apprehended. Other witnesses say that after a while the police tried to stop them, but the militants also attacked the police injuring some. Yesterday, as the news of attacks against Christians spread, in Lahore there was a demonstration to demand guarantees of freedom for Christians.